The value of pipe #268 is n/a points. Ron Davis won the bidding for a lot of several pipes on eBay this one among them. 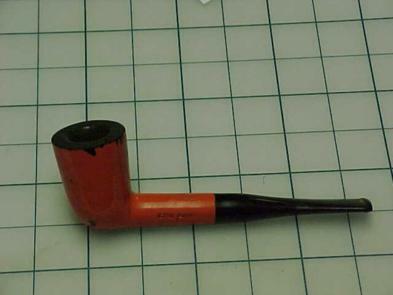 The description in the auction called it red, but it looked too orangey for a Burgundy Red pipe. When I wrote Ron, he called it orange, so I offered to buy it. He was quite reasonable in his price because there is quite a lot of damage to the paint, most of which does not show in the photo. Ultimately, better examples of the shape/color were found until this one was finally sold to Robert Beckman who wanted to try a the pipe and didn't care how it looked. Ugly as it is, it is good smoker.